The Spanish chroniclers who originally erased the indigenous peoples of the Caribbean off the map had forgotten to do one important thing along the way. They forgot to ask the people concerned what they thought about “their extinction.” If they had asked, they would have likely been ridiculed in the process. This is the way it would have been on the island of Borikén, since everyone had agreed with this history except the Indian people themselves. Borikén was an indigenous stronghold of the Antillean chain long before the European arrival. 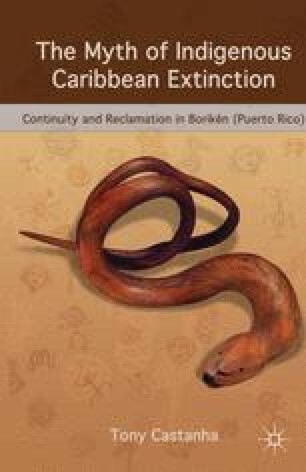 The southwestern coast, known as Baneke, or the “territory of the sea iguana,” was the nucleus of the Carib hegemony led by the cacike Agüeybana.2 “This was the nucleus of the empire,” said Lamourt-Valentín. “We were a great empire.” Loida Figueroa-Mercado writes that the indigenous culture “reached its zenith in Boriquén.”3 The island further comprised the northwestern territory called Caniba, or the “lizard,”4 from where the creation of the “canibal” came to be derived for the Carib or Jíbaro people living there. They fiercely resisted the Spanish encroachment so that cultural and oral traditions survived, have been passed down for generations, and are still preserved today.